The comfortable family room has a bank of bay-facing windows that let in lots of light. The first floor bedroom with queen bed faces wildflower gardens and a private sandy play space for the kids. The screened sun porch has a wicker chair and a couch, as well as a dining table for seven. Together they provide a perfect space for relaxing with a good book and a tall, icy beverage. The spacious upstairs bedrooms; the bay-facing bedroom with a queen bed and the second bedroom with a queen and a twin bed, bring the total cottage accommodations to seven happy vacationers. Outside, a super-sized teak table, a four-person high top table along with chairs and umbrellas, all placed on a wrap around deck with views of the bay and beautiful sunsets provide a perfect place for lobster dinners and lively conversation after a day of sun and surf. Start creating YOUR happy memories! Gateway to the Cape Cod National Seashore, the Town of Eastham is a coastal resort community straddling the arm of Cape Cod. Located on the outer Cape, the town is bounded on two sides by land, the other two by water, the Atlantic Ocean and Cape Cod Bay. Eastham is a quiet town with several ocean and bay beaches, a host of kettle ponds, pretty country lanes, panoramic views of Cape Cod Bay and the Atlantic Ocean, and lots of wide-open space for nature lovers. The Audubon Sanctuary in Well fleet is a popular spot and is only several miles away. We have vacationed with our family in Eastham for over twenty five years. It has always been our dream to own a home that we can share with others to create memories like the ones that we have enjoyed for so long. Eastham is an area for all ages and interests. It goes beyond the beautiful beaches and water sports to include sightseeing of American Indian and Pilgrim settlements, whale watching, nature trails, vineyard tours and natural history. The proximity of this cottage to the beach is commented on consistently by our guests. Being just a one minute walk away allows you to make easy trips back and forth whenever you need to, be it a cold drink, a bathroom visit or a change of clothes. The property itself offers a private yard for relaxing after a day at the beach or when cooking out. Our most popular feature at the cottage is the outdoor shower. Don't forget to try showering under the stars! However, before you do that, you'll want to walk those few steps back to the beach to watch the sun setting into the ocean or view it from the privacy of your own porch. This is an east coast rarity and one that never grows old - even after twenty five years! Outstanding views of the Bay from the second floor Master Bedroom. The cottage was formerly owned by two prominent people and good friends of ours, Ralph Alswang and Linda Kulman. Ralph was a White House photographer under President Bill Clinton for many years and Linda wrote much of the the NY Times #1 Best Seller The Amanda Knox Story during her summers at the cottage. Shower/no tub. Also hot water outdoor shower with changing area. Bathroom was recently renovated. 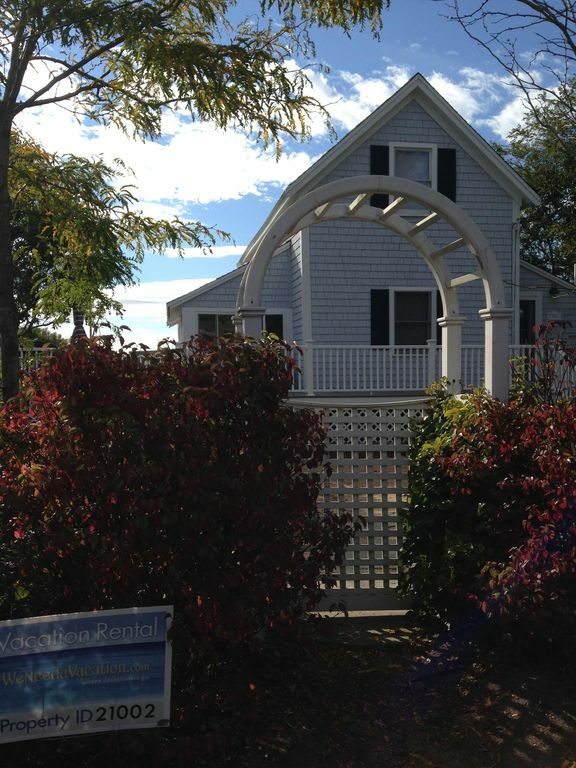 See the warm waters of Cape Cod Bay as you pull up to the front of the cottage only 50 steps away. Great views of Campground Beach and beyond to Brewster, Dennis, Plymouth and the setting sun! Spectacular views of Cape Cod bay and sunsets! Blankets and pillows are provided as well as some hand towels. Linens including sheets, pillow cases, beach, bath, hand and face towels are available for an additional charge of $25 person. A nice cottage in a beautiful setting. Cozy living room and kitchen. Single bathroom is tiny but functional. Wonderful sunroom and deck. Minutes from the beach. We stayed during the coldest Thanksgiving on record, but we had the best time. The cottage is cozy and well equipped...and the bay is right around the corner! The views from the upstairs bedroom were spectacular. The owners were a pleasure to deal with. We can't wait to return. Thank you Brigette! Yes, that was unusually cold weather, but hey, it's New England! Very cute cottage by the bay shore! Cozy and nice. We loved the location as well. We had a great experience. We loved being that close to the ocean. The morning and night walks on the beach were incredible. A Great House that made our vacation perfect! This was an absolute amazing vacation. The house was perfect and literally steps from the beach! The outdoor shower was just what we needed after a day at the beach. The view from the upstairs window was one of my favorites, especially to see when waking up. It only rained one day while we were there and watching/listening to the rain from the three season porch was another favorite of mine. The grill was another great amenity and we used it every night! Seriously, this is a home away from home and we are looking forward to next year! Thank you Tricia! The outdoor shower, the views, the porch and the grill as well as the location are definitely a few of our favorite amenities too! There's nothing like waking up to the view of the ocean from the upstairs bedroom too! This was the best vacation rental we ever stayed in. It was close to the beach and well equipped with everything we could possibly need during our stay including beach chairs and a wagon. The various areas for relaxing and enjoying at the house were numerous. We'll be back! The spacious living room has a bank of bay-facing windows that let in lots of light. The first floor bedroom faces a wildflower garden and private sandy play space for the kids. The screened sun porch has a wicker settee, wicker chairs, and a dining table for six. Together they provide a perfect space for relaxing with a good book and a tall, icy beverage. Three spacious bedrooms, two with queen-size beds and one with a queen and a twin can accommodate a total of six happy vacationers. Outside, a super-sized teak table, chairs and umbrella provide a perfect place for lobster dinners and lively conversation after a day of sun and surf. Start creating YOUR happy memories! Gateway to the Cape Cod National Seashore, the Town of Eastham is a coastal resort community straddling the arm of Cape Cod. Located on the outer Cape, the town is bounded on two sides by land, the other two by water, the Atlantic Ocean and Cape Cod Bay. Eastham is a quiet town with several ocean and bay beaches, a host of kettle ponds, pretty country lanes, panoramic views of Cape Cod Bay and the Atlantic Ocean, and lots of wide-open space for nature lovers. The Audubon Sanctuary in Well fleet is a popular spot and is only several miles away.